WarmlyYours snows melting mats safely and efficiently melt snow and ice from walkways, stoops, patios, and driveways. These 36 in x 120 in 240 VAC snow melting mats provide of coverage. 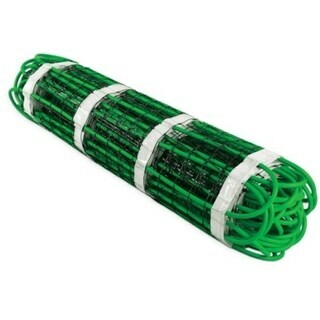 They feature a sturdy, corrosion-resistant, twin-conductor heating element affixed in a serpentine pattern to a polypropylene mesh backing, allowing for easy installation and even distribution of heat in asphalt, concrete or (mortar underneath) paver surfaces. Equipped with a 20-foot (6m) cold lead, WarmlyYours snow melting mats generate 50 watts per square foot for dependable and efficient snow melting performance and are CSA certified for outdoor use in Canadian and U.S. markets. Dimensions 120.0 In. X 36.0 In. X 0.25 In.